Opel unveiled the production-ready version of its sporty Adam S hatchback at the Paris Motor Show earlier this month after touting the concept in March at Geneva. The German retort to the Fiat 500 Abarth will go on sale in major European markets in early 2015 and Opel is looking to drum up some excitement with a short promo video ahead of its market launch. 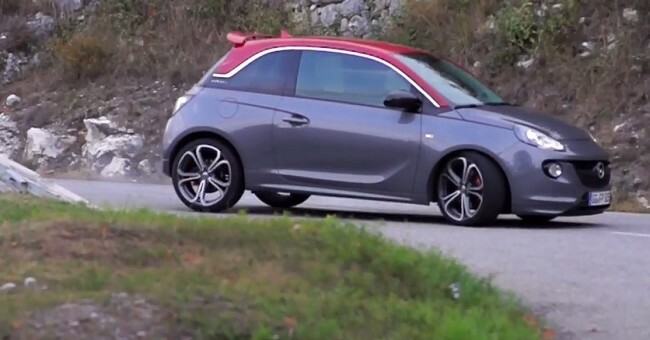 The Adam S is packing a 150 horsepower 1.4-liter turbocharged four-cylinder engine under its hood, which is linked up to a six-speed manual transmission. The performance package is completed with a sport-tuned suspension and chassis, OPC brakes, Recaro bucket seats, a spoiler and an exterior lip kit. The addition of the Adam S to the Adam lineup only makes us wish we could have a go in the Europe-only city car even more. For now, we’ll have to close our eyes and pretend were out for a spirited drive in the hot three-door on a twisty scenic route, just like the video below. better film ADAM S. this is cool but this is not OPC this is S.
This one is also great, thanks for sharing! Dang… I wish Buick could, and would, import this baby just the way it is. Fiat doesn’t have the ponies that the Adam has. On paper, this is a well balanced auto. If we had access to it… I would be all over this car.